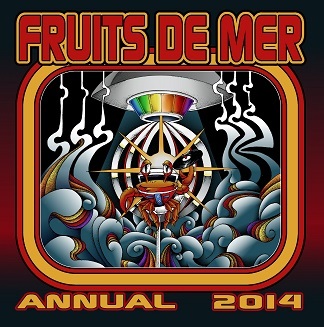 As 2013 winds down we get the new Fruits de Mer annual in which FdM Keith finds a home for songs he really liked but couldn’t fit anywhere else during year. I’d never heard of The Blue Giant Zeta Puppies and a quick search reveals them to be a UK based band (or more like a collective) that’s been around since 2010. They do a high energy Surf rocking cover of Barry Gray’s The Joe 90 Theme (60s UK sci-fi TV show), with lots of fun spaced out soaring electronics. AND they do a killer Surfin’ take on the Lost in Space theme. Johnny Remember Me was a 1961 UK hit for John Leyton and apparently Joe Meek’s first #1. Astralasia give it the cosmic electronic treatment while simultaneously retaining the Rawhide-like Country-ish vibe of the original. But then we get a second contribution from Astralasia called Johnny In Dub in which they take the song and do exactly what the title suggests. Freaky! The Raiders were a UK band whose 1964 song I Remember was never officially released. The guitarist, Trevor Midgley, went on to record as Beau for John Peel’s Dandelion label and has also contributed songs as Beau to a couple Fruits de Mer compilations. I Remember has a slow sort of ambient-Surf quality and is driven by a simple but lovely guitar melody.